Amphetamine is a CNSCentral Nervous System stimulant, producing mild euphoria and an abundance of energy. 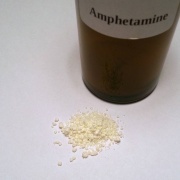 Amphetamines include both the specific chemical 'amphetamine' and the general class of chemicals which share structural similaries. 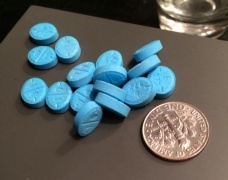 Amphetamines generally cause strong physical and mental stimulation, keeping users awake and alert for many hours, and some amphetamines cause mood lift / euphoria. Because they increase wakefulness, various amphetamines have been used by the military, by pilots, truck drivers, and other workers to keep functioning past their normal limits. Amphetamine was discovered in 1887 and exists as two enantiomers: levoamphetamine and dextroamphetamine. Amphetamine properly refers to the racemic free base, or equal parts of the enantiomers levoamphetamine and dextroamphetamine in their pure amine forms. Nonetheless, the term is frequently used informally to refer to any combination of the enantiomers, or to either of them alone. Depending on purity, amphetamine doses will vary. Branded amphetamine, like Adderall, knows similar yet better documented and thus more predictable doses. Some branded forms of amphetamine like Adderall, generally purposed to be prescribed to treat ADD and ADHD, are extended release (XR), which increases the duration of a single administration. See Stimulant Harm Reduction for general information.